LIMELIGHT, Charlie Chaplin's last American film, is best known today for its historic pairing of Chaplin and his friend and rival Buster Keaton in a short sketch toward the end of the film. Although it is a delight to see the two greats sharing the stage together, there is much more to LIMELIGHT than just this novelty. LIMELIGHT is at times mawkish, sentimental, frustrating, talky, old-fashioned and self-indulgent. If anybody else had made it except Chaplin, it might even be derided today as amateurish soap opera. Yet, if you are a Chaplin fan, LIMELIGHT is a fascinating trip inside the mind of an artist who believed his best work was behind him. Even if Chaplin did make two more films, LIMELIGHT neatly caps off the career of one of history's most famous artists. It tells the story of an old music hall clown who has been forgotten, and his friendship with a young dancer who believes herself unable to walk. The clown, Calvero, has dreams of being on stage doing his old routines and then looking out at an empty audience. Through his association with the dancer, who eventually becomes a star, he winds up famous once again, at least famous enough for a benefit in honor of his long career. It is as if Chaplin, saddened by his own fading popularity at the time, created the story as wish fulfillment. Although there are funny moments, the film is not a comedy. If THE KID was a film with "a smile, and some tears", LIMELIGHT could be called a film with "sadness, and some laughs." It is also a sound film made some 40-years plus after the age of silent movies that actually plays like an old silent melodrama. Chaplin often plays directly to the camera as if he were stilll The Little Tramp. He coached Clair Bloom in her acting debut, and it is no surprise that she sometimes overplays her part as if she were in a silent film. That being said, she is wonderful in the part, and ranks with Chaplin's best and most beautiful female co-stars. Buster Keaton fans may be disappointed with his appearance as Calvero's old music hall partner. 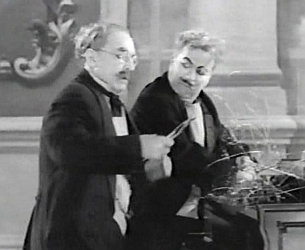 The two greats share about five minutes of screentime together, most of that time devoted to a musical routine featuring Chaplin as a mad violist and Keaton as a near-sighted piano player. 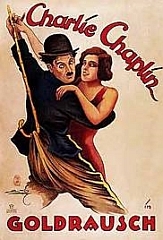 It's fascinating for those who wish to compare and constrast the styles of the two comedians - Chaplin the pantomimist versus Keaton the realist - but it's a pity the sketch isn't as funny as it should be.